I don’t know if you’ve heard about this, but newspapers are basically effed. They can’t continue to sell ads and print their product while other “media” are starting to move their content increasingly online. The printed paper will likely die with the last baby boomer (sorry Mum and Dad, but I read my news on the computer or on my phone). So Scott and I decided to find out exactly how effed newspapers are, and what they’re doing to mitigate their, um, effedness. Thankfully, before we set out on our quest, Karen Unland, the Edmonton Journal’s online editor contacted us and suggested it would be a good topic for the show. In our thirteenth episode (woooo! dun, dun, DUN) we try to sort out what direction news media is moving in and what some of the models could be for continuing to run “newspapers” online, while paying people to, you know, provide news and analysis. Listen, learn and love, friends! Would love your feedback in the comments and on iTunes as well! Holy typo, Batman! The hyperlink to Karen’s Twitter account has a .cim suffix, which of course should be .com. When will the interview become available on iTunes? Would it add context to the episode if I posted the two-page feature on masturbation Karen wrote when she edited the Gateway? 1. It should be available on iTunes right now… That’s how I downloaded and listened to it. 2. Yes. Absolutely. For the love of god please post it. I can see that Episode 13 is available for download for subscribers, but the intertubes do not favour those who are NOT subscribed. #fail. Oh, right, this isn’t Twitter. Hashtags don’t work. The photograph on bottom right, second page, is Karen as she looked at age 23. These links don’t work, Christopher! 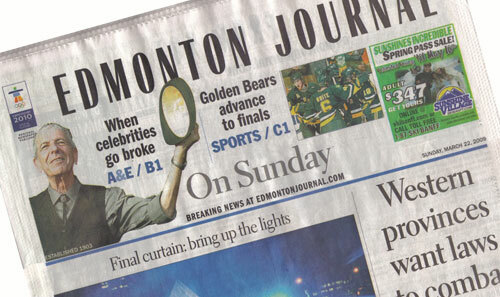 You don’t say “Edmonton Journal” near enough in this podcast. I felt like that was Karen’s responsibility!